My Little Pony - Freundschaft ist Magie kirsch Heels! 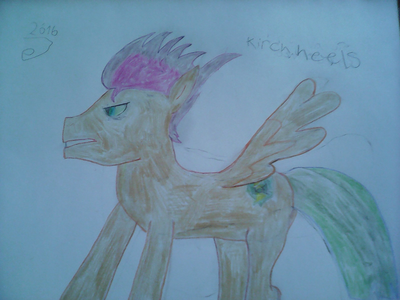 He is male pegesi and Flash sentry look-alike and got a viciously self-awareable reputation as the legendary Sentry of Equestria. he's quite compare to General Hardcastle(on Superman Animated Series) and got speed of one Cowboy Bebop villain's like Vicious. And he likes to keep things specifics around with his royal guards and always come out on top. Professor Pericles hire him to make sure that anyone of his guard keep on more 'serious'.